The scintillation counter is a device used to measure radiation output, more specifically gamma rays or photons and charged particles. 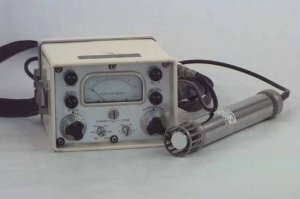 The counter consists of a portable metal box housing all the electronics, while the actual scintillation device is in a 20cm x4cm cylinder that is attached by a metre long wire to the measuring box. A typical detector uses material (in this case Sodium Iodide doped with Thallium) that emits tiny flashes of light or scintillations, when struck by energy such as gamma rays, charged particles, etc. This light hits the photocathode surface of a photomultiplier, ejecting photoelectrons that are then accelerated to strike dynodes. If the velocity that the photoelectron has is high enough, it can eject additional electrons. This process is called secondary emission. Typically with secondary emission the multiplication factor is between two to five. So for every electron hitting the dynode two to five electrons are ejected. By having lots of dynodes in series, a single electron can eject up to a billion more electrons. Scintillation counters usually have a resolution approximately ten nano-seconds (i.e. ten billionth's of a second.) and produce pulses whose amplitude is related to the energy of the radiation. Scintillation counters are used in measuring the radioactivity of materials, or areas affected by nuclear tests (e.g. nuclear weapons tests). Also there are biological applications, where it is possible to keep track of radioactive isotopes through a chemical or biological process and even keep track of isotopes spreading through the environment.